Congratulations to "JoAn V.", the winner in Terry's giveaway. Thank you to all who participated! I’m so excited to be back to tell you about the release of In Dire Straits, the third book in my Triple-D Ranch romantic suspense series. When I was here last, talking about In Deep Trouble, I mentioned I had booked a week on a Colorado cattle ranch, all in the name of research. I have to say, that was one of the best things I’ve ever done researching a book. First, the ranch’s slogan is “Where the Guests Are the Cowboys” and they weren’t kidding. They’re a working cattle ranch and they put you to work on day one. You’re assigned a horse based on your experience, and every morning before breakfast you’re up at the paddock brushing and saddling your mount. I had two that week—Sally, my first, was in heat so on the second day, she was given the rest of the week off and I was assigned to Dillon. 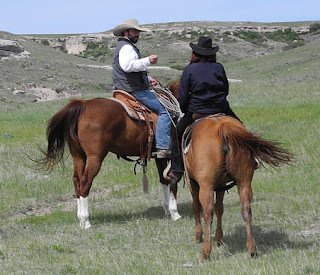 There were only 6 guests that week, and 4 were ‘repeaters’ so my husband (who had never been on a horse) and I (who hadn’t been on one since I was 12) went out with one of the wranglers so he could give us tips and make sure we were doing all right. Of course, I was busy asking him questions about ranching, and he was most helpful in answering. After lunch, having determined we were able to stay in the saddle, we joined the rest of the group and began doing real ranch work. 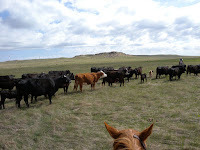 A lot of what we did was move cattle from one pasture to another, check for new calves, and check for any animals that looked distressed in any way. 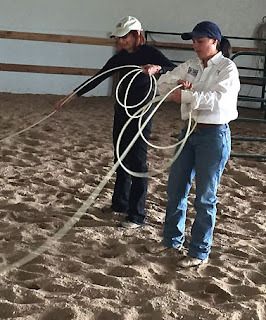 There were lessons on cutting and roping after the day’s cattle working was done. All in all, I have a much greater appreciation for what the hands on the Triple-D do every day. They made be fictional characters, but they’ve got a strong foothold in reality. When there’s trouble, he has your back. For Tim Halloran, Army Ranger turned Colorado cowboy, a simple life on a cattle ranch with no strings is his idea of perfection. Ranching lets him forget his haunting wartime experiences as an army sniper, and being the ranch clown is his coping mechanism. Bad jokes and a love ’em and leave ’em lifestyle make his world turn. Rebecca Morgan soon has his world spinning in another direction. Little does he know, the secrets she’s hiding will turn his life upside down. What will he give up to keep her safe—even if it turns out to be Rebecca? Rebecca Morgan needs to land a high-paying job to help cover her young nephew’s medical expenses. She’s confident once she completes a culinary school course, she’ll find a job as a private chef for the rich and famous in the Big Apple. An impoverished cowboy is not part of her dreams. But when her ex comes back into her life, threatening her family, Rebecca will stop at nothing to thwart his plans. Will she accept her ex’s demands for her nephew’s sake? Or will she find happiness with a wisecracking cowhand? As she drove past the ranch house, Rebecca slowed as a man using crutches seemed to be having trouble getting to a pickup truck. She looked again. Tim? What had happened? She had vague recollections of him favoring one leg when they’d worked together Sunday, but his limp hadn’t seemed crutch-worthy. He stayed where he was for a good long moment, and the tension in his face answered her question. “Let me help you,” she said, and picked up his fallen crutches. She tossed her head in exasperation. Did this man ever say anything without turning it into a joke? “You’d be the first—at least to do so literally.” She extended the crutches. He’d chosen a sizeable patch of ice to land in, and she realized that maneuvering himself up using the crutches wasn’t going to work. Farm life and carrying heavy drink trays had kept her upper body toned, so she helped him to his feet, supporting as much of his weight as she could manage as he hobbled to the porch. He grabbed the rail, turned around, and lowered himself to the second step, his right leg extended in front of him. She retrieved his second crutch, then sat beside him. He wore sweatpants and low-cut slip-on work shoes, not jeans and cowboy boots. No cowboy hat, either. He smelled good, too. Not that she cared, but there was no aura of manure hovering over him. Only soap and maleness. “Cow kicked me.” He tugged up the leg of his sweatpants and displayed a bandaged shin and a wrapped knee. “Cracked my fibula—that’s a little semi-useless bone in the shin. Got a piece of my ankle, but it’s my twisted knee causing the problems.” He massaged it gently and hissed in a breath. Why had she volunteered? There were cowboys galore out here, and they’d take care of one of their own, wouldn’t they? One lucky person leaving a comment or email entry will win a download of Book 1 in the series, In Hot Water. Giveaway ends 11:59pm EST Nov. 14th. Please supply your email in the post. You may use spaces or full text for security. (ex. jsmith at gmail dot com) If you do not wish to supply your email, or have trouble posting, please email maureen@justromanticsuspense.com with a subject title of JRS GIVEAWAY to be entered in the current giveaway. Congrats on the book release, Terry! Thanks, Dee ... It was really a lot of fun--a lot more than trying to Google information. Definitely - so much so that we booked a week for next year, too! Love your description of the cattle ranch. My family has a small ranch and your description was really accurate. I would love to read any of your books! Thanks, Kenra. I hope you'll visit my website and check out all my books. One of the reasons I selected Pamela Almand as the narrator of my Triple-D Ranch books is because she grew up on a Colorado cattle ranch and offered help with some details as well as narration. I'm not very good on horseback but that does sound like a very interesting working vacation. I haven't started this series yet but it sounds great so I'm putting it on my wish list. The beauty of it is the ranch works with you at any level of experience. My husband had never been on a horse, and he agreed we should go back, which is saying a lot. I figured he only came along because he thought I'd get totally lost trying to find the ranch. Also, almost everything done around the cattle is done at a very slow horseback pace; almost everything is done at a walk, so you don't need a lot of riding experience.